My latest book, The Women’s Football Encyclopedia, is the ultimate resource on the history of women’s football. It was published in January 2016 and covers the history of women’s football through 2015. But time marches on! During this past women’s football season, I provided weekly updates on game results for all leagues around the sport. I’m pleased to announce that I’ve compiled those results into a 2016 addendum to The Women’s Football Encyclopedia! There are two parts to the 2016 WFE addendum. Part I begins by recapping two small 2015 U.S.-based leagues that weren’t covered in the book. Part I then quickly moves on to cover all eight women’s football leagues from the 2016 women’s football season. The format is similar to what you’ll find for every league from 1999-2015 in chapter 2 of The Women’s Football Encyclopedia. By necessity, however, there are a few differences that I will outline here. In the league standings sections, the “before” and “after” columns for each team have been replaced by a “status” column. Each team’s “status” indicates any changes to the team’s name, makeup, or league affiliation from 2015 to 2016. It also notes the expansion teams for 2016. I have also added a section at the bottom of each league’s standings for “departing teams”. This section notes any teams that played in the league in 2015 and departed for another league in 2016 (whereby you can find those teams in the standings of their new league) and any 2015 teams that folded. Please note: many of the teams marked as “folded” have pledged a return in 2017. However, as we all know, that often doesn’t come to fruition…therefore, all teams that took the 2016 season off from competition are marked as “folded” until further notice. For the WFA, “departing teams” have been split across the three tiers based roughly on where I think they would have competed had they returned in 2016. The USWFL’s “departing teams” incorporates all teams from the now-defunct WSFL and W8FL. Moving along to the league scoreboard sections, game results are listed with home teams first to incorporate home/road splits into the 2016 addendum. This is a change from the way this section is handled in the encyclopedia. There was only one regular season neutral site game in women’s football that I’m aware of in 2016: the D.C. Divas and Keystone Assault game in Baltimore on May 14, which is denoted with an N. Championship game sites are listed in the championship game result line just below the season recap. The All-Star games for the WFA and IWFL are recorded there as well. Everything else from Part I of the addendum should be consistent with the format you know and love in Chapter 2 of The Women’s Football Encyclopedia. Players are listed alphabetically by last name, followed by the team code of the franchise they played for in 2016. Once again, players in the NMAFL-W and WXFL are not included…I’d love to hear from someone (anyone!) in one of those leagues. Until then, however, they are excluded by necessity. 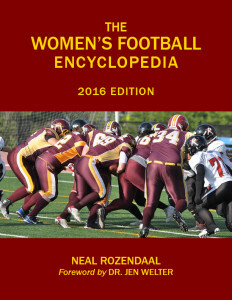 Anyway, here it is…the 2016 addendum to The Women’s Football Encyclopedia! Have you picked up your copy of The Women’s Football Encyclopedia yet? You really should…it’s the complete, authoritative history of our great sport. I still have a handful of numbered first-run books left…reserve your copy today!